Arthur: England’s Lost Prince – History… the interesting bits! A Plantagenet prince, Arthur of Brittany‘s story is one of the most tragic of the Medieval period. The posthumous son of Geoffrey, 4th son of Henry II of England, and Constance of Brittany, he was Duke of Brittany from the moment of his birth. Constance and Geoffrey had married in 1181; their daughter, Eleanor, was born in 1184. Whilst estranged from his father Geoffrey was trampled to death while competing at a tournament in Paris, in August 1186. Arthur was born several months later, in March or April 1187. In 1190 the two-year-old Arthur was named as heir presumptive to his uncle Richard I, king of England; Richard even arranged a betrothal for young Arthur, to a daughter of Tancred of Sicily. However, the Emperor Henry VI conquered Sicily in 1194 and the betrothal came to nothing. Arthur was a valuable pawn for both the kings of France and England; when Richard tried to take him into his household, in 1196, his mother sent him to the French court, where he spent several months. On his return to Brittany, Constance started involving him in the government of the duchy. The great William Marshal and Hubert Walter, Archbishop of Canterbury and Justiciar of England, were instrumental in persuading the English barons to accept John as King, reasoning that John knew more of England – and was more experienced – than young Arthur. 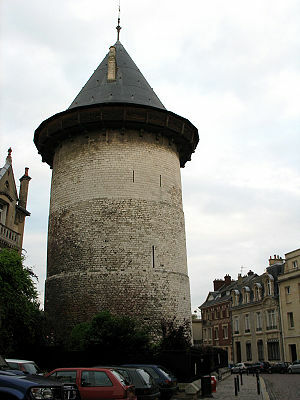 Arthur’s claim was revived in the early 1200s when the King of France, Philip II Augustus, confiscated John’s possessions in Northern France for failing to acknowledge the French King as his overlord. Philip recognised Arthur as the rightful heir to Normandy and Anjou. In July 1202 Arthur, and a force of knights, besieged his own grandmother, Eleanor of Aquitaine, at Mirebeau. John made a forced march to the rescue of his mother, surprising the besiegers on 31st July. One of John’s barons, William de Braose, captured Arthur on 1st August and handed him over to the King, who imprisoned him at Falaise. Whilst imprisoned at Falaise, John ordered that Arthur should be blinded and castrated. However, Arthur’s jailer Hubert de Burgh, balked at mutilating a 15-year-old and John ordered Arthur removed to confinement in Rouen. Whether John committed the deed himself, or merely ordered it done, will probably never be proved; of the fact he was present there seems to be little doubt. Whichever way, the act itself has been a black mark against John for centuries. On Arthur’s death the duchy should have passed to his older sister, Eleanor; but she was also a prisoner of King John. So it passed to his two-year-old half-sister, Alix of Thouars, daughter of Constance and her 3rd husband, Guy of Thouars. Lol welcome to the family……. Hi just a quick question, which source was your quote from Marshal about the conditions of John’s prisoners from? I haven’t seen it before and it seems out of character for him so I’d love to know where it came from. Great post too. Hi and thank you. Marshal’s quote was in Dan Jones’ book, The plantagenets:The Kings who made England. Thanks, I’ll have to have a look. I don’t have a copy and I’d love to know where he got it I’ll have to find one in the library. Pingback: ‘The Pearl of Brittany’ – History… the interesting bits! Pingback: Maud de Braose, the King’s Enemy – History… the interesting bits! Pingback: Nichola de la Haye, England’s Forgotten Heroine – History… the interesting bits! Too bad they didn’t back Arthur instead of John esp since Marshall took on Henry III years later as a child. Might have seen a much better king! Yes, I have always wondered what would have been England’s future been if Arthur had been king, instead of John. Or, even if Richard had not died. Ah, Well, such is history and the ‘what if’s of life. That’s why we have Allison Weir and readers like us! Another great article! I would like to write a novel featuring Maud de Braose when I am done with my current project, so this incident will be a key element. Thanks! I have to finish with Margaret Pole first. She’s being a bit shy. Very interesting post. It is hard to imagine the awful things that were done behind the glamour of living in a castle. Thank you Laura. Yes, it’s nice to read about history – but I’m not sure I’d want to live there, far to dangerous!